If you’ve watched the Another anime and are looking for a quick answer regarding whether or not you should read the novel the anime is based on: Yes, you should read it. It’s a fun book and a quick read. It’s just as creepy as the anime, but it’s creepy in different ways. The basic plot is the same, but enough of the details are different to maintain a feeling of suspense. Before I begin, I should say that this review only covers the first volume of a two-volume novel. According to Amazon, the second volume won’t be released until July 23, 2013. 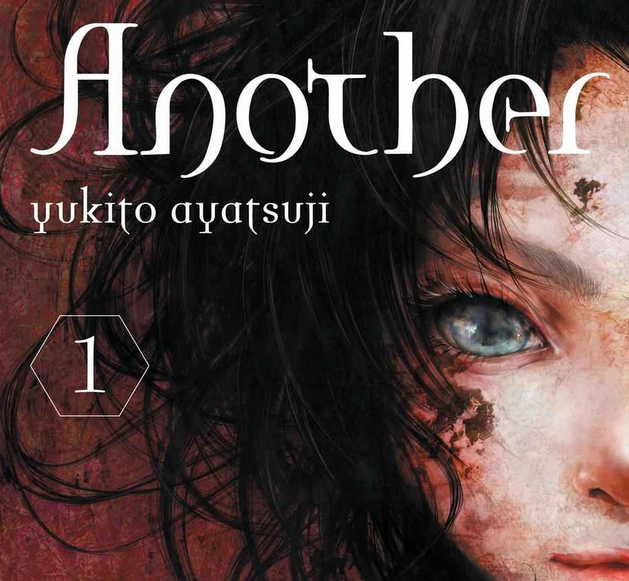 Since Another is a highly compelling mystery novel, and since the first volume doesn’t offer closure but instead only deepens the mystery, I might caution anyone who hasn’t already seen the Another anime series (which is available on Hulu) against reading the first half before the second half is available. Another begins in April of 1998 in a small mountain town called Yomiyama. The narrator is Sakakibara Kōichi, who suffers from a lung disease called “primary spontaneous pneumothorax.” Since his father is spending a year abroad in India, Kōichi has moved from Tokyo to Yomiyama to live with the parents of his deceased mother. Before he can start ninth grade with his new class (the Japanese school year begins in April) at the North Yomi Middle School, however, Kōichi suffers a relapse of his disease and is hospitalized. While in the hospital, he is visited by two students from his class who badger him with a series of unpleasantly persistent questions about his background in relation to Yomiyama. Even more curious is his encounter with a strangely taciturn girl wearing a North Yomi uniform in the hospital’s elevator. This girl, Misaki Mei, is wearing a conspicuous eye patch and headed down to a part of the hospital basement that should be empty. As soon as Kōichi is released from the hospital, his mother’s younger sister Reiko, who lives with Kōichi’s grandparents, sits him down and tells him the “North Yomi fundamentals,” the third of which is “you must at all costs obey whatever the class decides.” Kōichi, who had been bullied at his old school because of his family name, is uncomfortable with this rule; and, when he finally begins school, he is unpleasantly surprised when he realizes that everyone in his class is bullying Mei. No one acknowledges her presence in the classroom, and no one will discuss her with Kōichi. Kōichi gets hints that what is going on is more than mere bullying, however; the class’s treatment of Mei is somehow tied to a curse laid on the third class of the third year students at North Yomi. Another is half horror and half mystery. The horror comes from the existence of ineffable supernatural phenomena, the grisly deaths of Kōichi’s classmates, and the looming inevitability of the class’s fate. The “you must at all costs obey whatever the class decides” dictum is majorly creepy as well. These horror elements lend a major sense of urgency to the mysteries Kōichi must puzzle out: Why is everyone ignoring Misaki Mei? What is the curse afflicting Class 3-3? How did the curse come about, and how does it work? The answers to these questions are eventually revealed at the end of the volume. To be honest, the specifics of the curse don’t actually make a great deal of practical sense, but that’s okay – the setup and nature of the curse are clever and interesting. Since this is only the first half of the story, it goes without saying that not everything is revealed. In fact, the end of the first volume sets up an even more interesting mystery. The curse is apparently linked to one specific person in each class in which the curse is active, the so-called “casualty” (死者), but who could this be? The first volume doesn’t give the reader the necessary clues to figure this out, but it does hint at a particularly nasty moral dilemma that the reader can look forward to exploring in the second half of the story. Another isn’t the most beautifully written book in the world. When compared to the anime, with its moody musical score, atmospheric lighting, and lush background images, the novel doesn’t seem to take full advantage of the potential creepiness of its setting in an isolated mountain town before the advent of widespread cell phone and internet use. What the novel does do is to deliver an additively readable young adult horror story that can also be read as a power fantasy of working through some of the more unpleasant aspects of ninth grade. A new kid transfers into a new class at a new school, and things are weird and awkward not because fifteen-year-olds are weird and awkward but because there’s a curse. The class seems to be bullying a shy girl who doesn’t fit in not because fifteen-year-olds can be terrible people but because there’s a curse. The homeroom teacher is sketchy and the librarian is spooky not because some adults have trouble dealing with fifteen-year-olds but because there’s a curse. Class 3-3 is in its own little universe created by both unknowable supernatural forces and unstated institutional regulations, and everything the students in the class do is truly a matter of life and death. Under the veneer of normalcy created by daily routine, nothing is normal at all, and the sickly transfer student and uncanny quiet girl might just end up being the heroes who save everyone. It’s a fairly heady fantasy for anyone who’s ever that things at their middle/high school weren’t quite right. Even without the analogy to the implicit strangeness of ninth grade, the momentum of the race to get to the bottom of what’s going on at North Yomi Middle School is enough to keep anyone reading until the end. Even though I know what happens, I’m still eagerly awaiting the second volume.